The Asia-Europe Meeting (ASEM) is an intergovernmental process established in 1996 to foster dialogue and cooperation between Asia and Europe. Presently it comprises 53 Partners: 30 European and 21 Asian countries, the European Union and the ASEAN Secretariat. ASEM addresses political, economic, financial, social, cultural, and educational issues of common interest in a spirit of mutual respect and equal partnership. The initial ASEM Partnership in 1996 consisted of 15 EU Member States and 7 ASEAN Member States plus China, Japan, Korea and the European Commission. The ASEM Summit is a biennial meeting between the Heads of State and Government, the President of the European Council, the President of the European Commission, and the Secretary-General of the Association of Southeast Asian Nations (ASEAN). As an informal process of dialogue and cooperation, based on equal partnership and enhancing mutual understanding, ASEM can best work to facilitate and stimulate progress in other fora, and should not seek to duplicate what is being done within bilateral and other multilateral relationships with Asia. It provides an open forum for policy makers and officials to discuss any political, economic and socio-cultural issues of common interest, complementing the work already being carried out in bilateral and other multilateral fora. It covers the full spectrum of relations between the two regions and devotes equal weight to political, economic and socio-cultural dimensions. It eschews any "aid-based" relationship taken forward under our bilateral relations in favour of a more general process of dialogue and co-operation based on mutual respect and mutual benefit. It provides a platform for meetings of Heads of States and Governments, Ministers and Senior Officials, and with an increasing focus on fostering contacts between societies in all sectors in the two regions. ASEM covers potentially all issues of common interest to Europe and Asia. ASEM has provided a dialogue platform to address international matters such as United Nations reforms, weapons of mass destruction (WMD) issues, terrorism, migration flows or WTO negotiations.. Asia and Europe have worked together for improving the international security environment. Overall, ASEM has become a useful process for managing globalization and its effects, for enhancing interregional and international business frameworks, and promoting the role of the Euro in Asia. ASEM is also about people and culture. It has served as a dialogue facilitator and helped increasing mutual understanding through people-to-people contacts. In that context, ASEM should be considered as a dialogue process as well as a delivery instrument. In fact, since no formal negotiations take place within ASEM, it is difficult to quantify the real contribution of ASEM on a particular issue. The delivery aspect of ASEM is not always visible since concrete developments may occur elsewhere in a more formal setting. ASEM is a policy-making laboratory. By promoting an open and inclusive dialogue, ASEM has allowed its participants to develop and test new ideas for future policy-making. By creating a permanent process of consultation, ASEM has helped to streamline the international agenda. As a forum promoting an open and informal dialogue, ASEM provides an opportunity to work towards negotiated solutions, especially in areas of disagreement. It provides additional consultation opportunities before official negotiations take place at a multilateral conference. Because ASEM remains an informal dialogue-based process, there is no formal or structured agenda. One specific institution, the Asia-Europe Foundation (ASEF), has been created in response to Summit decisions. ASEM also creates opportunities for exchanging experiences and share knowledge. It facilitates some transfer of technology to Asian countries who have shown interest in the European regional integration developments. In the meantime, European partners can gain a better understanding of regional developments in Asia and the perspectives of Asia's regional integration. ASEM helps to build common knowledge on specific issues too. This feature might play a growing role in an enlarged ASEM, especially on trans-national and security issues, in particular for the fight against international terrorism. ASEM was established as a new process between Asia-Europe, which complements existing Europe-Asia relations. ASEM is not a substitute for other bilateral or multilateral fora between Asia and Europe, and it can best work to facilitate and stimulate progress in other for a. As a new layer of dialogue and cooperation, ASEM has enhanced synergies in Europe-Asia relations. ASEM has also served as catalyst for overall Asia-Europe relations and complements other levels of relations between the two regions. The origins of the ASEM Process lay in a mutual recognition, in both Asia and Europe, that the relationship between the two regions needed to be strengthened, reflecting the new global context of the 1990s, and the perspectives of the new century. In July 1994, the European Commission had already published Towards a New Strategy for Asia, stressing the importance of modernising its relationship with Asia, and of reflecting properly its political, economic and cultural significance. The Commission Communication of September 2001, entitled Europe and Asia: A Strategic Framework for Enhanced Partnerships, reaffirmed this objective. In November 1994, Singapore and France proposed that an EU-Asia summit meeting be held, to consider how to build a new partnership between the two regions. 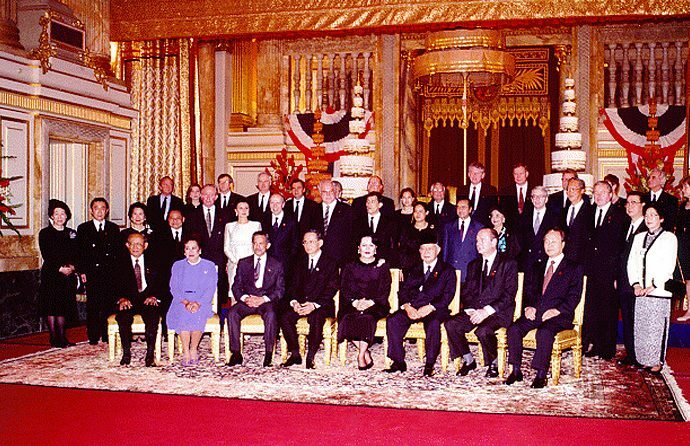 Following Singapore's proposal, the 1st ASEM Summit (ASEM1) was held in March 1996 in Bangkok, Thailand, which marks the beginning of the Asia-Europe Meeting (ASEM) Process. ASEM saw the first enlargement in 2004 during the 5th ASEM Summit (ASEM5) in Hanoi (Viet Nam), where the 10 new EU Member States (Cyprus, Czech Republic, Estonia, Hungary, Latvia, Lithuania, Malta, Poland, Slovakia, Slovenia) and 3 new ASEAN countries (Cambodia, Lao PDR, Myanmar) became officially part of the ASEM Process. The second round of enlargement in 2008 during the 7th ASEM Summit (ASEM7) in Beijing (China) brought in 6 new Partners: Bulgaria, India, Mongolia, Pakistan, Romania, and the ASEAN Secretariat, increasing total membership to 45 ASEM Partners. In October 2010, the 8th ASEM Summit (ASEM8) of Heads of Government and State in Brussels (Belgium) welcomed 3 new partners to the ASEM Process (Australia, New Zealand, and the Russia Federation). This third round of enlargement increased the partnership to 48 ASEM Partners. In November 2012, during the 9th ASEM Summit (ASEM9) of Heads of Government and State in Vientiane (Lao PDR), Bangladesh, Norway, and Switzerland officially joined. This round of enlargement brought the partnership to 51 ASEM Partners. The latest round of enlargement during the 10th ASEM Summit (ASEM10) in October 2014 in Milan (Italy) welcomed Croatia on the European side, and Kazakhstan on the Asian side. This brings the partnership to 53 ASEM Partners.